This is the third set of patterns based on Orry-Kelly’s designs for movie stars and featured in The Delineator magazine. 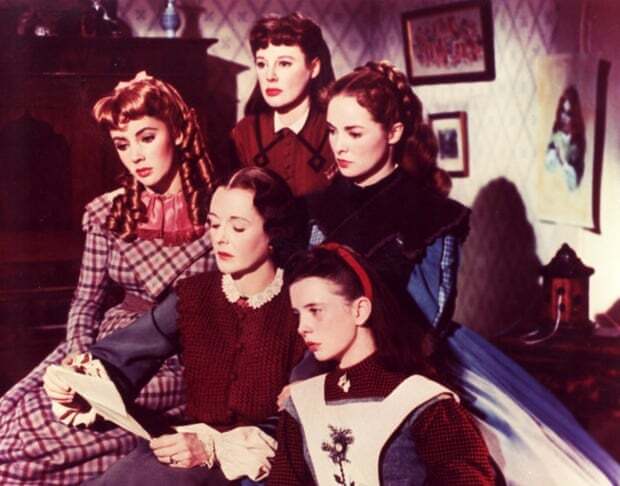 (Click here for Part 1, Bette Davis and more about Orry-Kelly.) (Click Here for Part 2, Kay Francis.) 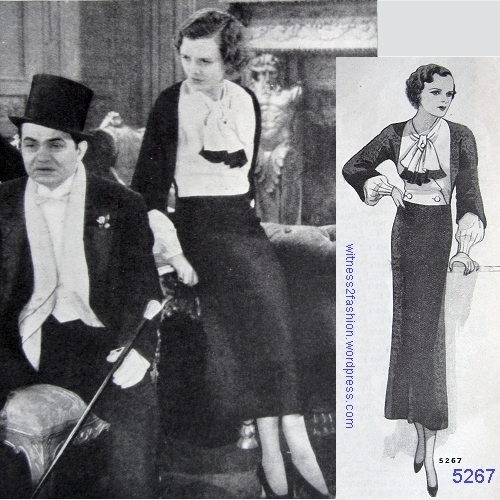 Butterick had permission to make exact copies of the clothes worn in certain movies in 1933. 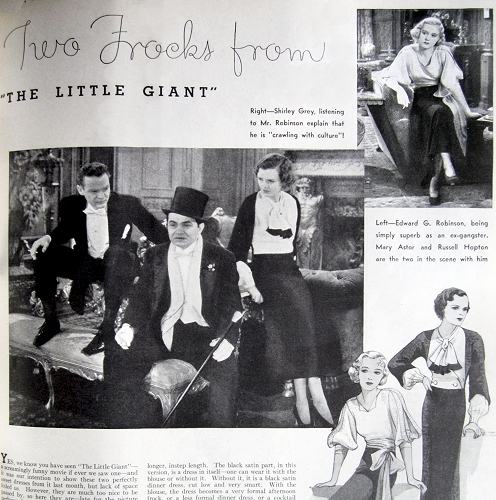 Two Frocks from The Little Giant; Delineator, July 1933, p. 55. 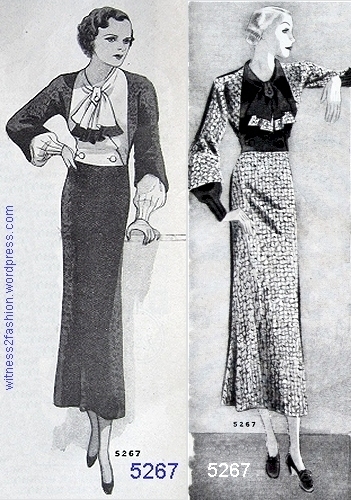 One of these Butterick Starred Patterns was a dress for Mary Astor, who really was a star in the twenties, thirties and forties, and the other was for Shirley Grey, a lesser-known actress. Butterick Starred Pattern 5271, designed for Shirley Grey by Orry-Kelly. Delineator, July 1933. Partly open sleeves were seen on several designs in 1933. However, you can see this dress without the “blouse” at the Vintage Pattern Wikia. Click here. Mary Astor in a dress by Orry-Kelly that was copied as Butterick 5267 . Delineator, July, 1933. 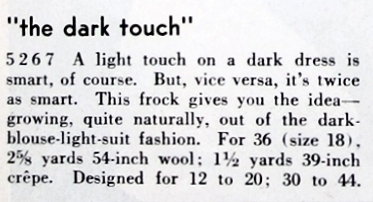 Description of Butterick Starred Pattern 5267, from July 1933. 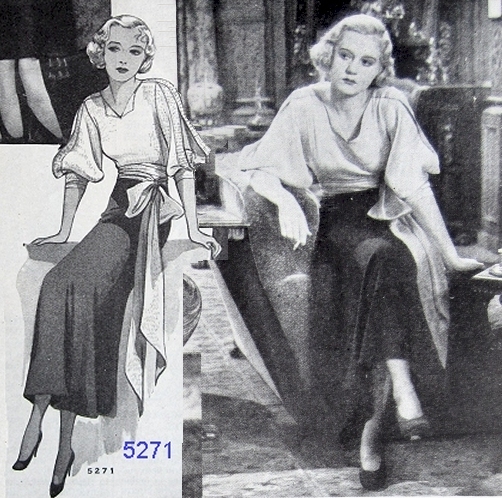 Butterick 5267 as drawn in July and August, 1933. 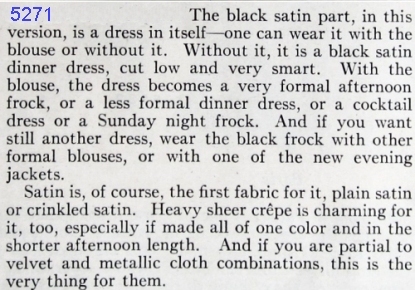 Butterick 5267 as described in the August 1933 Delineator. You can see a larger illustration of 5267 at the Vintage Pattern Wikia. Mary Astor was a child actress whose career lasted well into middle age. 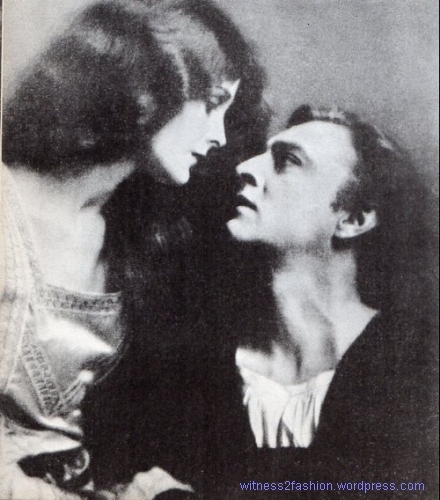 She played Ophelia to John Barrymore’s Hamlet on the stage, transitioned easily from silents to talkies, survived a huge scandal, and graduated to mature roles (and an Oscar *TM*) in the 1940’s. She is best remembered as the temptress in The Maltese Falcon, the mother in Meet Me In St. Louis, and Marmee in Little Women. The list of her credits (155 movies and TV episodes) at The Internet Movie Database pretty much defines “working actress.” She also wrote two books: My Story and My Life on Film. 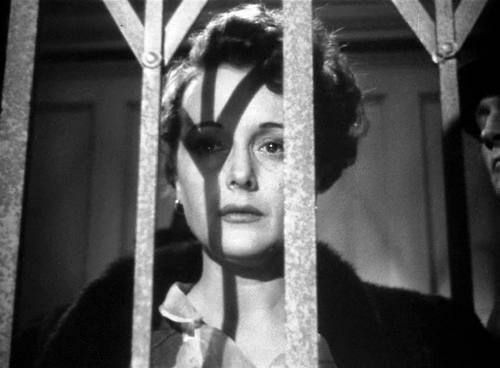 You can get a tiny sampling of her work in this one minute Tribute from Turner Classic Movies. 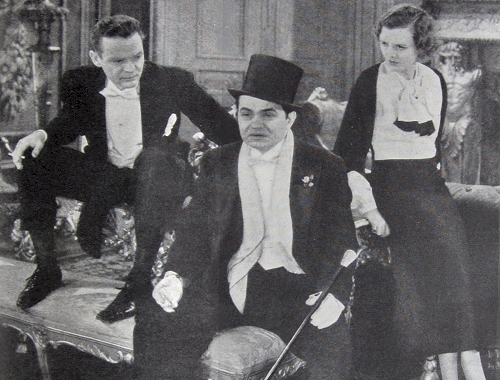 Russell Hopton, Edward G. Robinson and Mary Astor in The Little Giant, Delineator magazine, July 1933. The TCM tribute to Edward G. Robinson is six minutes long, but a reminder of his versatility. Click here. Next: Butterick Starred Patterns Part 4: Katharine Hepburn and Helen Chandler in designs by Howard Greer. I am a retired art teacher and have been sewing since 1964. I have really enjoyed your articles. I just wanted you to know.